I've spoken before on my blog about how one of my favourite parts of parenthood is getting to choose outfits for my little ones and this has yet to change! I spend approximately 70% of my free time filling up my baskets with all sorts of gorgeous outfits for the boys on various clothes websites but I don't actually complete the checkout process as often as I'd like to because - unfortunately - the clothes I like aren't always that cheap and with 3 little ones to buy for, it adds up quickly! Now I don't have massively expensive tastes - it's not like I insist on clothing the boys in designer gear from head to foot, but I don't really love supermarket brands or Primark for boys clothing as I find it tends to be a little too "safe" or "traditionally boyish" for my taste - they seem a little bit fond of the dinosaur/digger prints and plain old jeans and that isn't really the style I tend to go for, so I usually prefer to shop at places like Zara, H & M and Next. When I just had the one baby to buy for, this wasn't a problem - but like I said, with 3 of them to clothe it really does add up fast so if I can find ways to save a few pounds here and there, I absolutely will. 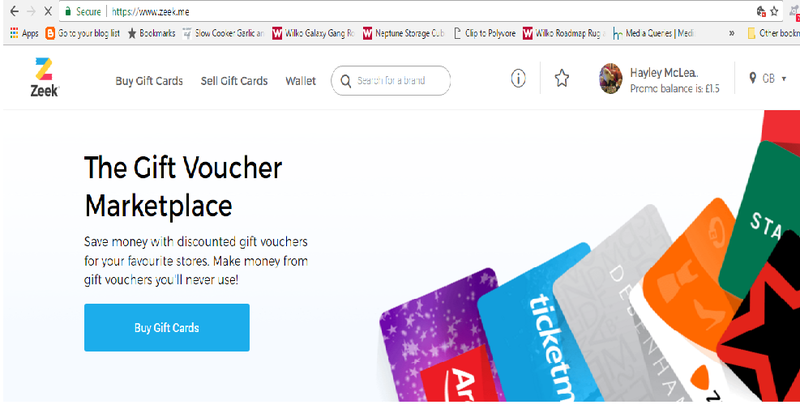 I was recently introduced to Zeek - an online market place for unwanted gift cards which enables you to purchase a gift card for the store of your choice at a discounted rate. There are absolutely tons of high street stores listed on Zeek, so when I was given £50 credit to spend in order to try the service out I was a little bit spoiled for choice - but in the end I decided to go with a Next voucher, as I knew I'd be able to get some great bits for the boys wardrobes in there and I wasn't disappointed! I had soon filled up my basket with £50 worth of lovely clothes for the boys, so I headed on to Zeek - searched for "Next Vouchers" and chose the one I wanted from a list of those available (making sure I selected one that could be spent online!). I was able to buy a £50 Next Voucher for £46, which I know is not a massive saving but I was to save that every time I shopped for the boys it would soon add up - I mean lets face it, if you were given a 10% off code you'd use it, right?! So I see this as being a very similar thing, and the process of buying and using the gift card adds no time at all to the process. I simply bought the gift card on Zeek, it gave me the gift card number and PIN right away - I then popped over to the Next website, entered the numbers and that was that! It's also worth noting that you tend to see bigger savings when you purchase gift cards of a higher value too, so if you're doing a large order online or have something big to purchase then you may well be able to make a substantial saving by using Zeek - at the very least it's definitely worth a look before you buy anything as if you can save some money, why wouldn't you?